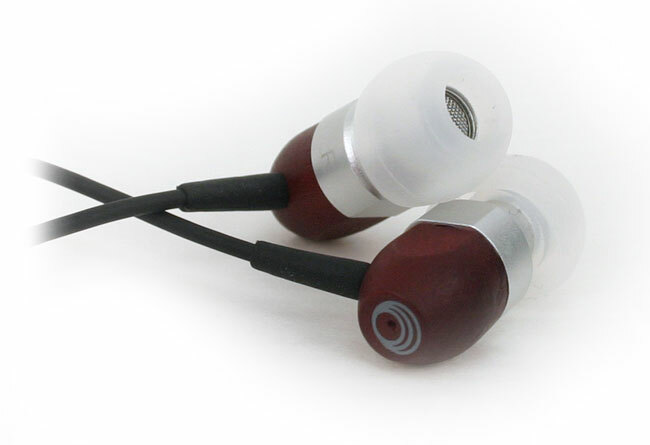 Thinksound’s ts02+micearbud headphones offer comfort and deep bass in a distinctive package. 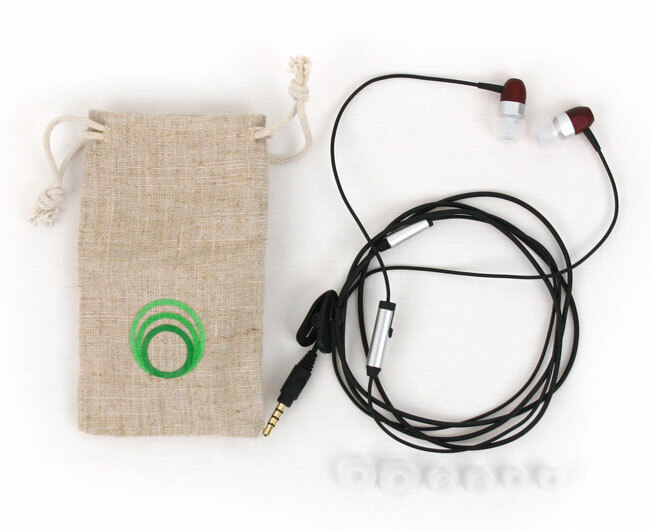 Nature conscience headphone manufacturer Thinksound is at it again with its new ts02+mic earbuds, designed for use with Apple iPod products, as well as iPhones and Blackberrys. Touted as “high definition” headphones, the ts02+mic ear buds feature an 8mm driver housed in a wooden enclosure. Thinksound claims the wooden enclosure helps to provide a natural and accurate music reproduction. Add the hemp-looking cloth bag, the recycled packaging materials combined with the wooden enclosure, and you have a pretty good marketing story right? What separates the ts02+mic from the other ear buds in the company’s arsenal is iPod, iPhone and Blackberry compatibility, and a smaller-sized 8mm driver (the rain micros use a 9mm driver and the larger ts01’s use a 10mm driver) which features a solid 20Hz to 20kHz frequency response. Priced at $99 MSRP, you can purchase the ts02+mic ear buds from the Thinksound directly or from Amazon.com. The ts02+mic ear buds come with four different silicon tips to fit any ear size, a 3.5mm (standard-sized) gold plated plug, cord clip and carrying case. Thinksound has increased the warranty since the last pair of headphones we reviewed, to an impressive one year. While the packaging and overall presentation would suggest a pair of ear buds that might fall in the “value” category found at your local Target store, make no mistake, these are high-end ear buds and their $99 price tag should give that away. Fit and finish of the ear buds themselves are above average, with a high-quality wood stain on the ear pieces and super soft silicon tips. Accessories we would have liked to have seen (and which are becoming typical fare lately) would include an audio splitter and airline adapter. We tested the ts02+mic ear buds using an Apple iPod nano, Apple iPhone 4, and Blackberry Bold 9700. Music in our tests included Phoenix’s Wolfgang Amadeus, Broken Bells’ The High Road and Johnny Cash’s The Legend of Johnny Cash. We broke the ts02+mic’s in for more than 40 hours before testing. True to advertising, the ts02+mic exhibit exceptional bass which although tight and deep, can become overwhelming at times. Midrange audio and vocals are a step back from the front of the soundstage, but are still not drowned out and provide a warm, enveloping feel. Acoustic and vocal tracks in general feel full sounding. Those into hip hop will enjoy the deep bass; we didn’t experience any muddiness in our tests. The in-line mic works as it’s supposed to, but we found it a little frustrating overall. Those of you with Apple Shuffles will be familiar with the one-button control, where one click pauses the music, two clicks skips to the next song and three clicks advances backwards. Holding down the button will read back the song title and album in a text-speech-voice (on Apple products). There is no way to control the volume with the in-line remote, and if there is, we couldn’t figure it out. The problem is that Thinksound did not bother to include an instruction manual with these ear buds, so you are forced to figure this control scheme out on your own. Other headphone manufacturerstypically include three buttons on their inline remote controls which let you adjust the volume and other settingsand more easily. Hopefully this is something Thinksound will fix in the future. The inline microphone works without a hitch, and we experienced no complaints from users when talking on their phone while using the ts02+mic. After prolonged use, we didn’t experience any major ear fatigue either (read: sore ears) thanks to the softer-than-normal silicon ear tips. Thinksound has a solid winner on their hands with the ts02+mic ear buds. Audio enthusiasts should find these ear buds sound great with most, if not all music genres; imaging and a warm midrange really make the ts02+mic stand out. Bass is a tad on the heavy side, and may not appeal to audio purists. The inline remote controls are very confusing, and are sure to turn off those not willing to take the time to learn them. The $99 price tag is also a little high, we feel. The sweet spot here should be in the $70-80 range. Overall, the Thinksound ts02+mic ear buds will definitely be appealing to people wanting a good set of headphones for their mobile phones, and Blackberry owners should be extremely happy to get a nice compatible set to use for a change.